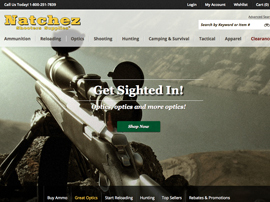 Description Natchez Shooters Supplies is a trusted source for all of your outdoor needs. Two families of sportsmen started the business 38 years ago with a goal to provide a one-stop-shop for quality outdoor products. Today, Natchez Shooters Supplies is an online supplier of ammunition, optics, shooting supplies, tactical products, hunting, camping and survival gear. When you’re looking for the products outdoorsmen and hunters use, shop Natchez Shooters Supplies for the ultimate selection and customer experience.